18 Sept 2012: [Extension] The extension went from being a windowless empty shell to something you can live in and use the heating in. 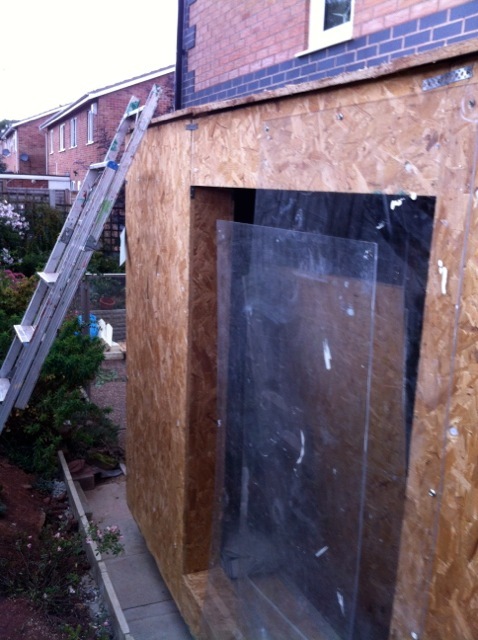 Although the windows won't be delivered until early October, I have enough polycarbonate to build two temporary windows, which make the building nearly airtight. 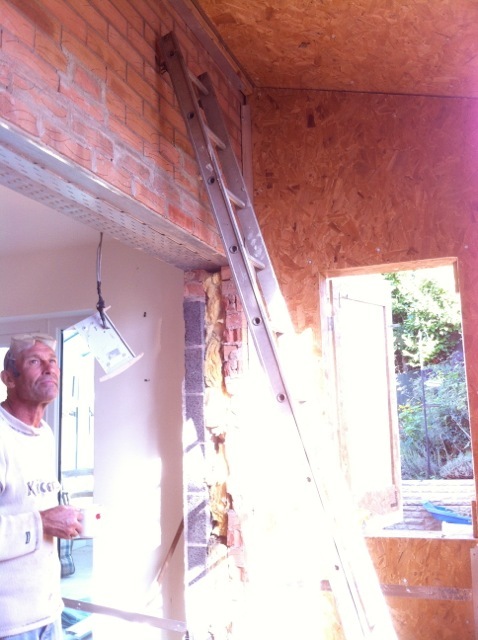 We managed to straighten out the roof and realised that we needn't have cut those 5mm strips off the third cassette. 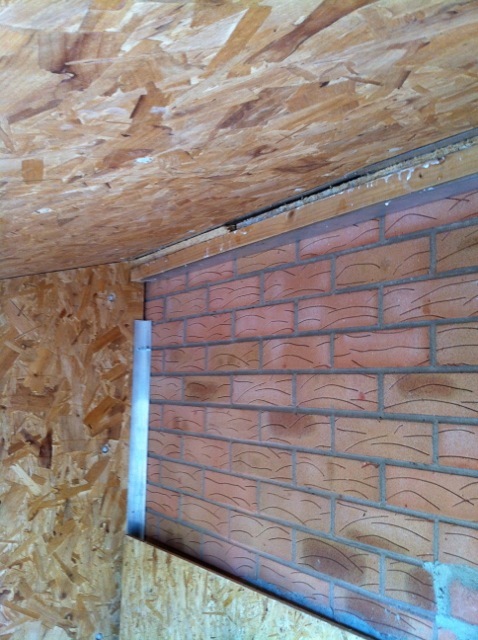 With a bit of adjustment, the roof panels fitted perfectly, and the 5mm gaps now show. Never mind, they will be closed off. Andy also sealed the space below the SIPS panels, and did a lot more aluminium edge framing. 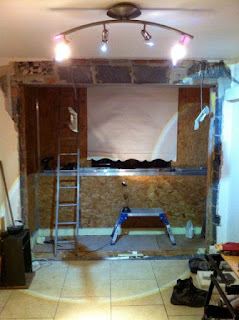 First thing is to put in a temporary window. Although I bought some plastic sheet from B&Q, I then discovered three sheets 2m x 800mm in the skip outside my office at the university which provide the perfect material for a large window. 4mm Polycarbonate! 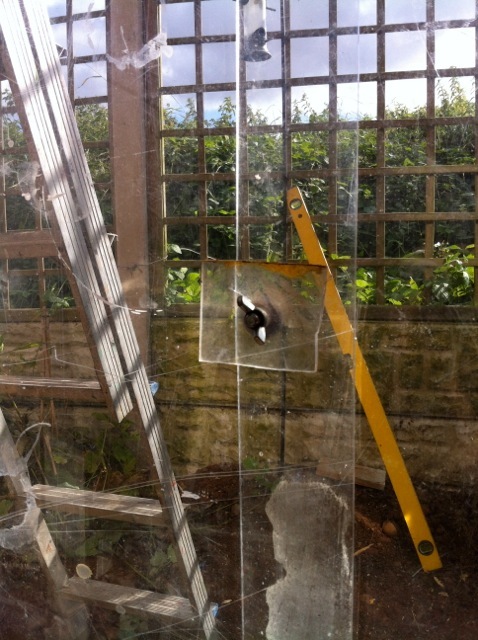 The two large sheets overlap, and are secured at the centre by a thick piece of polycarbonate that has been lying around in the garden for more than a year - now it has found a use! 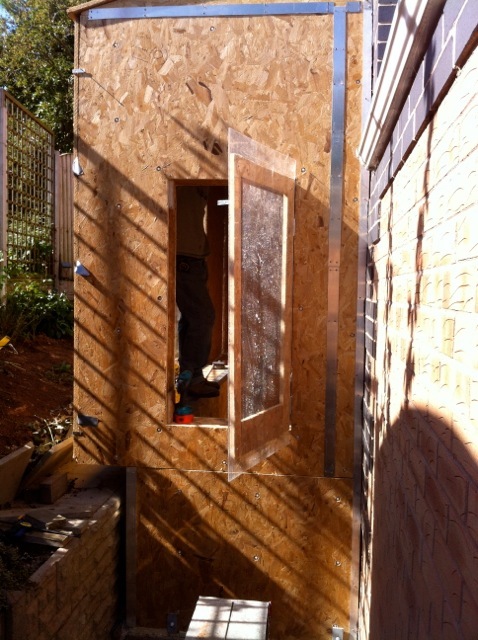 The small side window is replaced with polycarbonate and a bit of OSB wood framing. The window is nicely rebated in the frame so that it is draught proof. 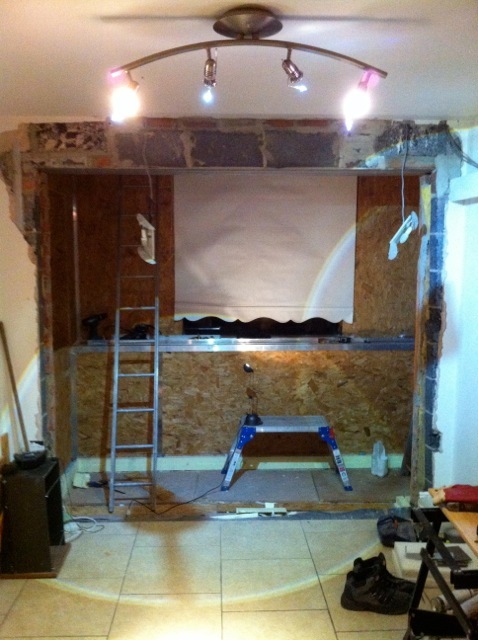 Now that it is closed in, we can take down the hoarding separating it from the house, so that there is more space to work on the interior. 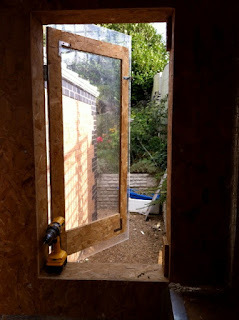 The new side window opens and shuts just like a real one, and is not draughty. Richard Pearson of Pearson Scaffolding came at lunchtime to do a quotation for scaffolding on two levels, one around the roof of the extension, and then a higher level (bridging across the extension) to get access to the Surya Sunbox. 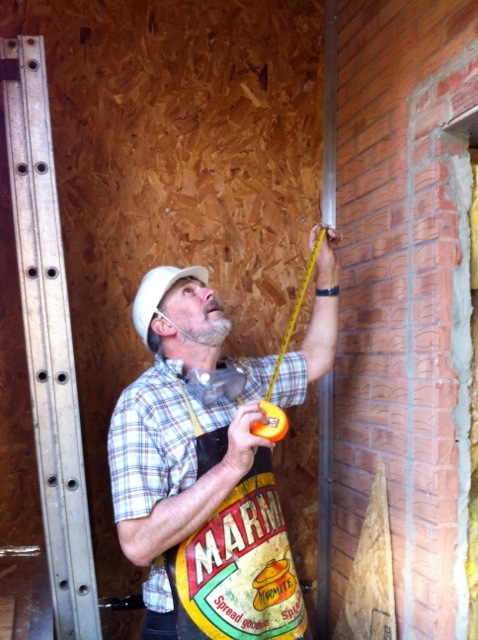 We had some fun and games getting the roof to fit perfectly, and even here, there is a small error. 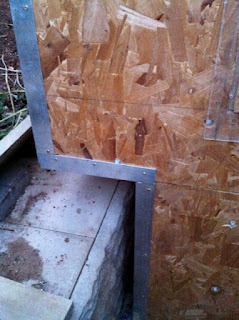 The wall plate is a consistent trapezoidal section, but at this west end, we have to insert slivers of additional OSB so that it sits sweetly on the angle. Andy spent much of the day taping junctions and corners. 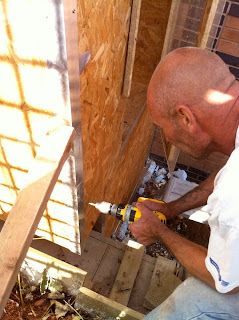 He was then cutting more aluminium sections to make every corner structurally connected. The outside corners are all secured with 50x50mm aluminium angle, and interior corners are using either 25x25 or 40x40 aluminium. It becomes a strong monocoque, like the Surya Sunbox above. We have had a productive day and Andy considers his handiwork with a hot cup of tea. His work is now finished, sadly, it has been fun working on this project. DNC wonders if he really got all this right! Looking up, it seems that he has! 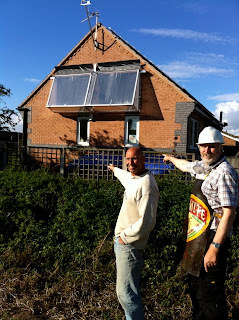 The Extension is habitable! 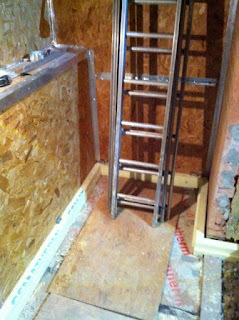 We could even turn on the heating as it is now airtight. 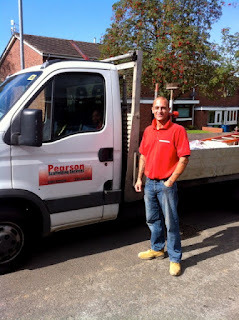 Just before Andy goes, we get the roof waterproofed with a tarpaulin, and then take a walk on the field behind and find a passer by to take a photo of the two joinery champions. The entire extension is below the line of the fence. 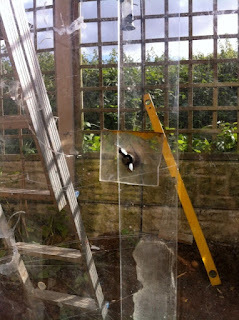 Maybe I should replace that open timber grid with a large polycarbonate sheet in a metal frame. First view of what the full space will look like, with daylight flooding in. 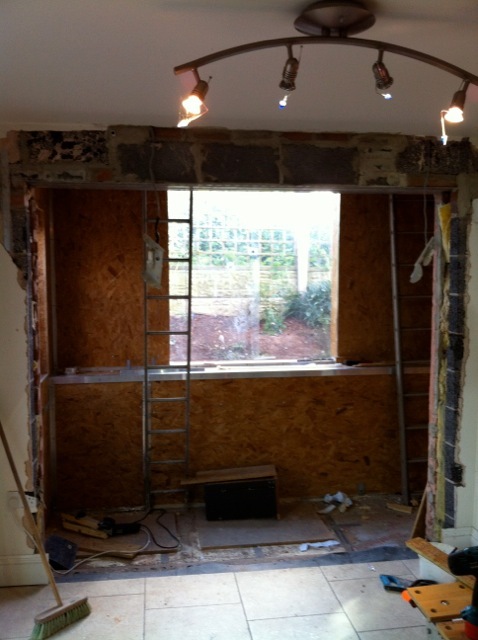 I am extremely glad I opted to have that very large continuous sill across the south wall, particularly during the building work where it provides space for drills, screws and all manner of useful things! 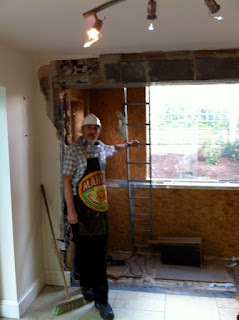 DNC in his Marmite apron, enjoying the experience of being in the new enlarge dining space. 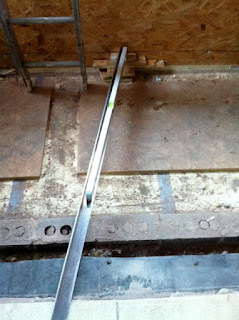 Evening work: Spirit level establishes where the floor level will be. The structural screed level has to be 15mm below that level to allow for tiling and skirtings. Note that earlier in the day, Andy spent time fitting wedges of PIR foam between the SIPS panels and the concrete foundation wall, to make that joint airtight. 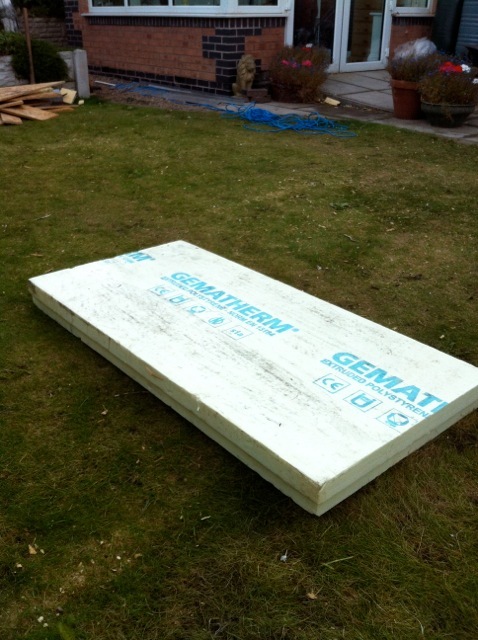 The height of the structural screed is precisely 100mm, so this sheet of 100mm insulation will do nicely… prepare to be sliced up! The insulation (this type is extruded styrofoam) is sliced into 50mm sections. 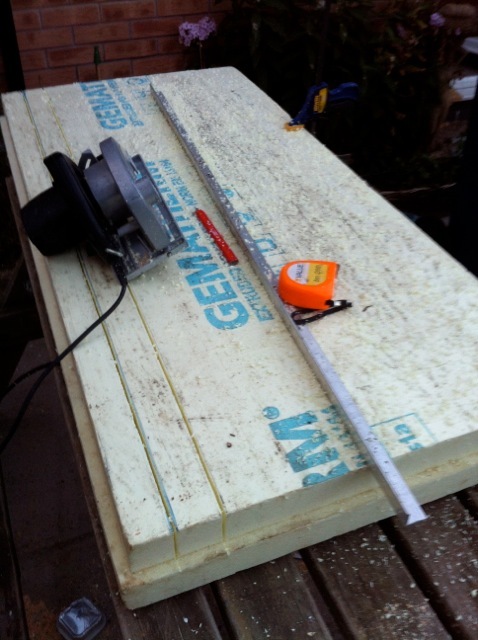 These slices will form a below-floor insulated skirting, to ensure that there's no contact between the screed and the concrete foundation. Some of the slices have to be three-dimensionally modelled to fit around difficult shapes, such as the steel feet and the existing brick wall. 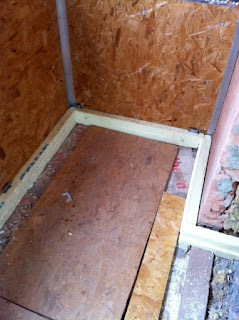 One corner is fitted out with low skirting pieces. 50mm of extruded styrofoam is waterproof and a good insulator. I found another use for Nylon threaded rods. 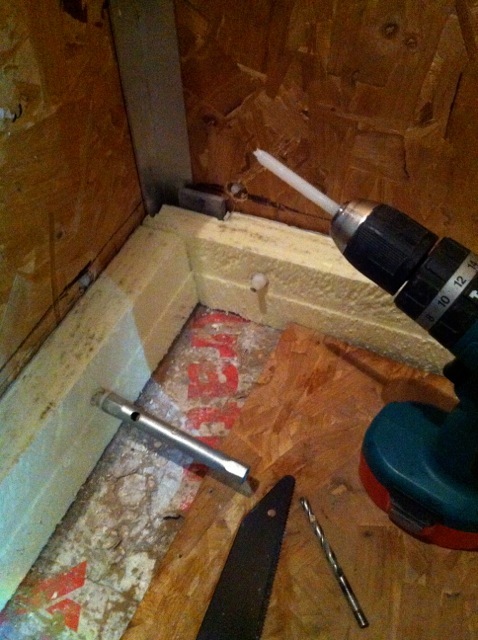 They are all 8mm so by drilling an 8mm hole in the OSB, and sharpening the end of the rod to a point with a surform, the rods can be driven into the hole like a screw, using the cordless drill. 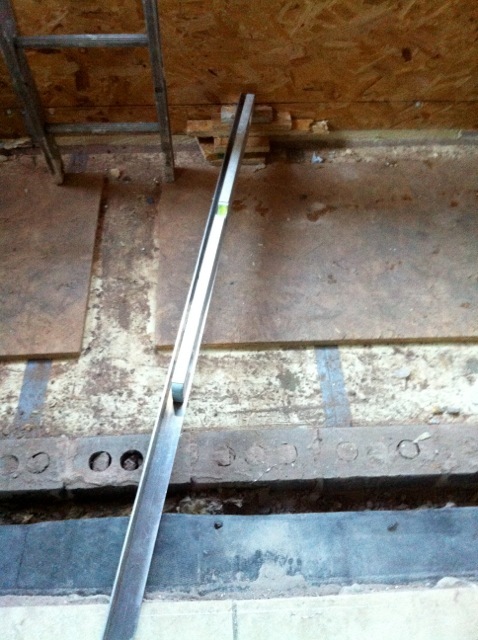 The are held securely and a nylon nut can be fitted over. 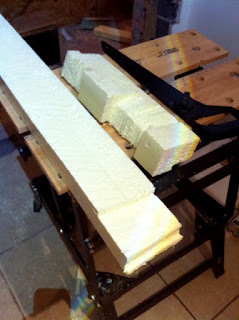 Now there is good progress with the skirting. It will entirely contain the screed, and there is a thin separating line of insulation (and expansion gap) where it will meet the heated floor. BBC 10 o clock news on the radio, Forest and Crystal Palace drew 1-1, Man City lost in Madrid, and we have got the extension habitable and warm, even with the pull-down blind restored. 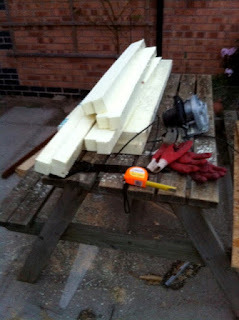 I have followed your instructions and read a lot about polycarbonate. this is a great tips ,,and nobody will share this tips for polycarbonate like you. I am requested to all visitors of this blog that they should only 1 click on the ads showing on this blog,,,one click will never cost us anything,,but this is a way of thanks..